It’s my last weekend in Senegal! I am feeling sort of bereft. Last night we were searching out a place that Google Maps had pinpointed exactly but that neither GPS nor the actual layout of the streets would allow us to find in real life. Par for the course. My friends called out to me from down the sandy, silent road – they thought they had figured out the way, while I was busy scoping out another direction – and as I was running to catch up to them, something caught in my throat and my inner voice shouted out at me, “STAY! YOU ARE LEAVING TOO SOON!” But alas, it will always feel too soon, and I’ve got compelling reasons to go exactly when I’m going. One of those reasons – a small but not insignificant one for someone in my line of work – is that I am in the midst of a full-blown movie drought. Considering that I am in the land of Ousmane Sembène, the most famous African filmmaker, it is really strange that there are no honest-to-goodness movie theaters in Dakar. Apparently the last one closed in the 90’s or early 2000’s. 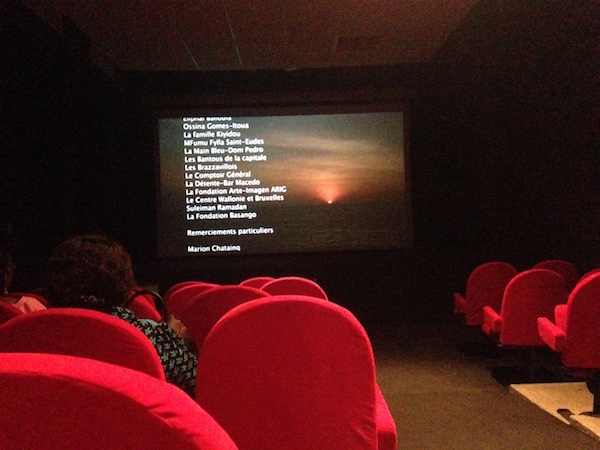 Instead, there are small screening rooms, like the one I went to at the French Institute (pictured above) to see a documentary about the way that rumba on either side of the Atlantic has cross-pollinated with the other side. (Perfect subject, mediocre film.) 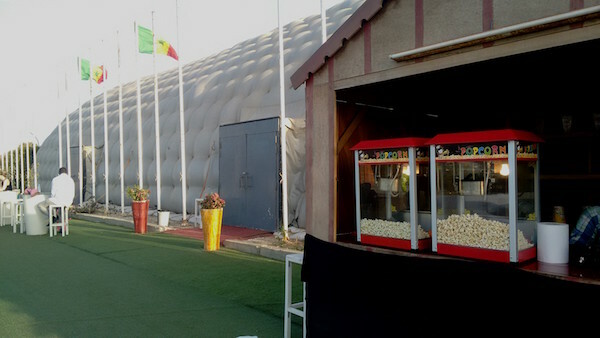 There is also a full-sized movie screen in a supposedly temporary inflatable structure near the shopping center on the waterfront. I tried going to the movies there the few times they looked good enough to bother. The first couple of times were fails of my own doing. The third time, there were “technical difficulties” and they told me to come back the next week. The fourth time was the charm, and I saw “Fences” there the night before the Oscars. But it was hard to hear the dialogue because the structure kept making weird sucking noises and expanding and contracting like it was breathing. A pretty subpar theatre; I hadn’t been missing much by staying away. Meanwhile, the films they play on TV are either terrible and/or overdubbed in French, which I find impossible to watch. (My theory is that since I rely a lot upon lip-reading to understand French, my brain gets hopelessly confused when watching people whose mouths don’t match the words coming out of them.) And I can’t stream movies on my laptop in my room because of my horrible Internet situation (which, by the way, I’ve realized is a product not only of the slow wi-fi in my neighborhood, but also of the very thick walls in my building. I may just have the worst Internet connection in town.) Thus I’ve seen a grand total of exactly four full movies in Senegal. By contrast, I probably saw 100 the previous year. So, I am leaving Senegal too soon, but I also can’t get back to movies soon enough. I am so excited to catch up on all that I’ve missed and to watch some new releases in one of my favorite New York cinemas. Now… switching abruptly to your weekend reads, and flailing for a transition. How about, you are excused from reading these if you go to the movies instead? There is an earphone coming out that will translate foreign language speech into your own language. Apparently in France I may be heading towards exactly what I was running away from in New York: the creeping big-boxification of urban spaces. Too old to learn a language? Don’t believe it. US citizens traveling to Europe may soon need a visa. Beautiful photos of Portugese fishing in the 1950s. Well, this is a relief for someone like me, who takes forever to spit out her thoughts: fast talkers and slow talkers end up conveying the same amount of information in the same amount of time. What gets easier when you study more languages? 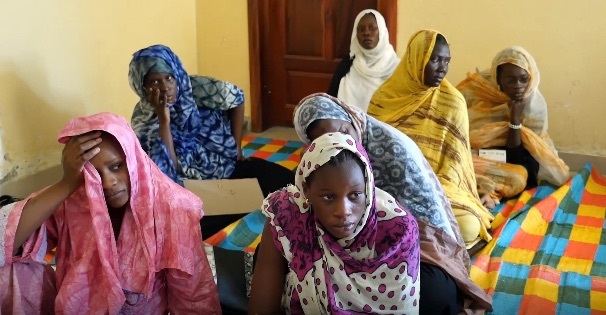 Recently, I wrote about my trip to Mauritania, which was part of a four-country shoot for videos about local change-makers who are helping to turn the tide against female genital mutilation, or FGM. FGM is a subject I’ve cared about for many years, and I’m so happy I finally had a chance to work on a video about it. I’m even happier that the video’s message is a positive one rather than a downer. One year ago today I arrived in Senegal. Just yesterday, I posted a love letter to my home for the past year, Dakar, so I won’t do that again today. Instead, I will post a most fitting love letter to myself. I, after all, got me here. Now, I’ve had the time of my life. No, I never felt like this before. Yes, I swear, it’s the truth, and I owe it all to you. I’ve been waiting for so long, now I’ve finally found someone to stand by me. We saw the writing on the wall as we felt this magical fantasy. Now with passion in our eyes, there’s no way we could disguise it secretly. So we take each other’s hand, ‘cause we seem to understand the urgency. Just remember: you’re the one thing I can’t get enough of. So I’ll tell you something – this could be love, because I’ve had the time of my life. No, I never felt this way before. Yes I swear, it’s the truth, and I owe it all to you. ‘Cause I’ve had the time of my life, and I’ve searched though every open door, ’til I found the truth, and I owe it all to you. P.S. We can build this dream together, standing strong forever, nothing’s gonna stop us now. And if this world runs out of lovers, we’ll still have each other. Nothing’s gonna stop us, nothing’s gonna stop us now. 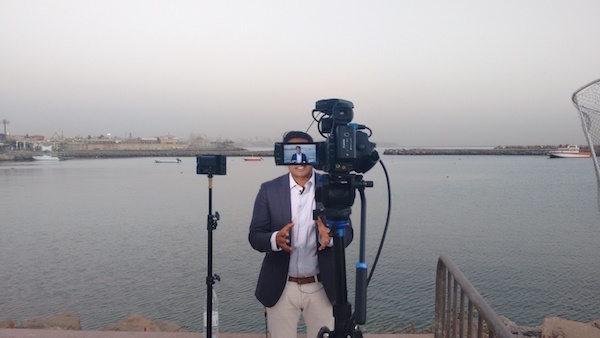 Last week, I emerged from my funk just in time for, and perhaps in part because of, a 5 day-long job subbing in as cameraperson for a major news network’s live broadcasts about the political crisis in The Gambia. I just noticed that the videos I made in Benin have been published, and I realized I never shared the ones I made in Senegal, so here they are. 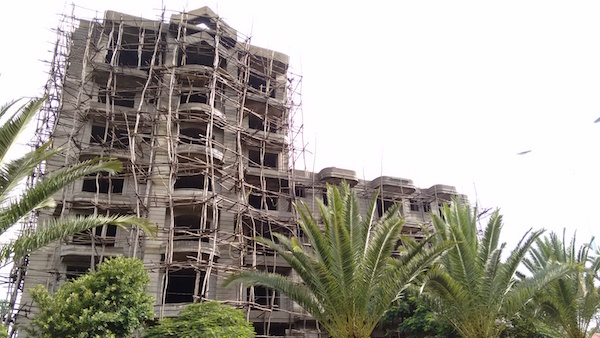 – Their scaffolding is seriously death-defying (or not). 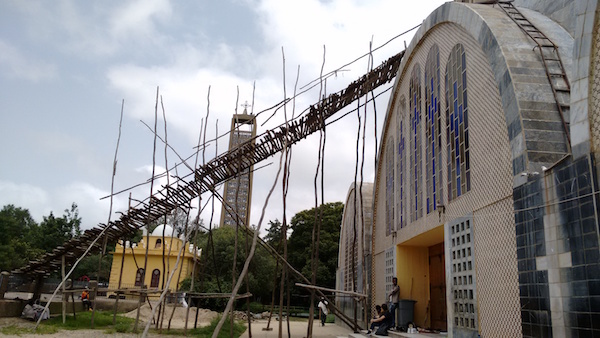 Ethiopia was the first time I saw anything like this and I thought it was a unique quirk of the country, but then I saw it in Benin and said a silent prayer for their construction workers, too. 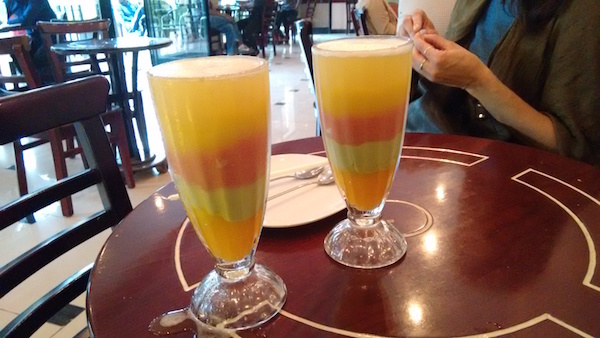 – Juice bars are ubiquitous, and mixed juice smoothies served parfait-style is very popular (and delicious, especially when avocado is one of the layers). I would think that having juice bars on every corner would be the bi-product of a country in which alcohol is prohibited, but that’s not the case. Maybe they just know that they lucked out in the local fruit lottery (papaya, mango, avocado, pineapple…) and are taking advantage of it? 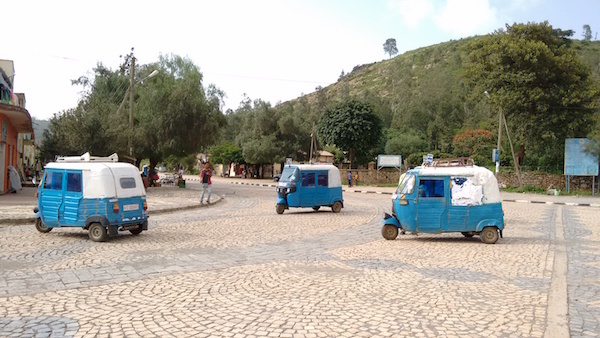 – As I mentioned before, Ethiopia is the only African country not to have been colonized by the West. 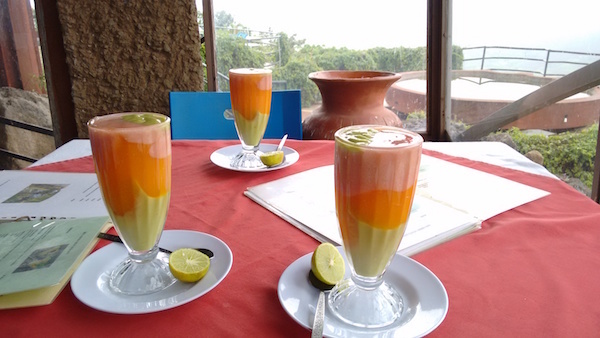 – Ethiopian cuisine is entirely unique. The ancient grain, teff, is grown throughout Ethiopia and hardly anywhere else in the world. 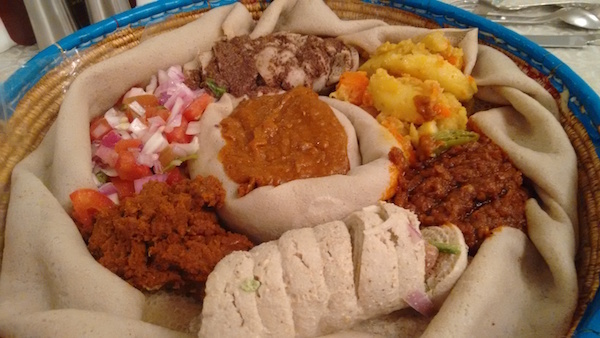 Since teff is what injera is made out of, and since injera is served with almost everything, it means that Ethiopian food tastes different than any other food on earth (except for maybe Eritrean?…). I can’t say it (literally) moves me, but it does fascinate me. – They use their own quirky clock (and their own calendar), and it definitely doesn’t match their official time zone. This article explains. If you lack the attention span for a 14-minute video on reproductive health, here’s a 4-minute version. And here’s an even shorter cut that AJ+ did using my footage. Documentaries / non-fiction videos are often trees falling in forests, but AJ+ has a really big audience and their piece has gotten over 300,000 views so far, which makes me very, very happy. It was such a privilege to see Liberia in the way that I did through this project. While I love dropping into a place as a tourist and observing on a surface level, it’s a different and deeper kind of enrichment to spend time in a country where your primary purpose is to document some facet of humanity. Criss-crossing the country from Monrovia to the most remote villages, I got up close and personal with people – mostly women – whose lives and experiences have been about as different from my own as you can get. Strangers afforded me access to their private lives, thoughts, and feelings, and they entrusted me to portray them sensitively to the public. It always amazes me when that happens, considering how guarded I personally am in front of a camera. I would never claim to “know” Liberia or Liberians after only two weeks… but I will say that what I experienced there has made a huge impact on how I “know” and see and feel about myself and the world. I think that is the greatest gift that travel – and this line of work – can give you.